Banksy is at it again. 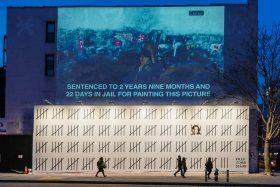 Last Friday, we highlighted the 70-foot mural on the Houston Bowery Wall depicting the Turkish artist Zehra Dogan’s unjust prison sentence. Now the elusive street artist is taking credit for two murals on a derelict site slated for redevelopment in Midwood, Brooklyn, reports Hyperallergic. 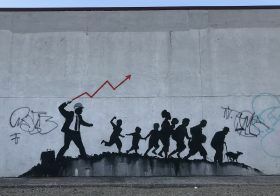 One of the murals depicts a man in a suit and hard hat (most likely a real estate developer), cracking a whip that looks like a stock market up arrow, over a group of children and adults desperate to get away. Coincidence or not, Trump has properties in nearby Coney Island. The mural is classic Banksy commentary on the evils and influence of capitalism. The provocative and still anonymous artist Banksy has come back to New York after a five-year hiatus (he was last seen in New York selling his work for $60 a piece in Central Park). After a tease yesterday, his 70-foot mural on the Houston Bowery Wall, made famous by Keith Haring in 1982, depicts 365 hash marks and an image of the Turkish artist Zehra Dogan behind prison bars and the final prison bar transforms into a pencil. The image represents the amount of time Dogan has spent in jail for painting a picture of a war-torn town in Turkey. Elusive graffiti artist Banksy has graced the streets of New York City once again with a new bewhiskered art offering, this time a rat scurrying inside a clock on the side of a former bank at 101 West 14th Street; the building is slated for demolition in a few months. Banksy posted news of his newest addition via his Instagram account yesterday.